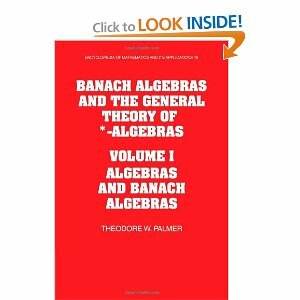 Banach Algebras and the General Theory of *-Algebras, Volume I: Algebras and Banach Algebras, Cambridge, England; New York: Cambridge University Press, 1994, (Encyclopedia of Mathematics and its Applications, 49.) Pp. [xii], 794. Banach Algebras and the General Theory of *-Algebras, Volume II: *-Algebras, Cambridge, England; New York: Cambridge University Press, 2001, (Encyclopedia of Mathematics and its Applications, 79.) Pp. [xii], 795 – 1617. In these two volumes I describe my research and put it into context. A 67 page bibliography in the second volume is intended to provide an introduction to the whole field at the end of the Twentieth Century. The book contains brief historical essays on many topics. In the second paper Gelfand proves Wiener’s theorem in less than a page. This theorem was the crowning achievement of Norbert Wiener (November 26, 1894 to March 18, 1964) an American child prodigy and famously eclectic (and eccentric) mathematician at MIT. His original proof was very long and difficult extending over a series of papers using only analysis. Modern mathematics is commonly divided into two parts: algebra and analysis. Algebra is an enormous extension of high school algebra. Analysis begins with calculus, where all results come from some sort of limiting process. Gelfand clearly saw an algebraic structure underlying many parts of analysis and exploited it. Obviously the theory should be named Gelfand algebras. Stefan Banach (March 30, 1892 to August 31, 1945) was a Polish mathematician who summarized much of his research in a 1932 book written in French: Théorie des opérations linéaires . With little advanced formal education, Banach had systematized the subject of functional analysis within analysis. This became one of the leading fields of early Twentieth Century mathematics. Banach’s fundamental theorems gave Gelfand the leverage to prove the new algebraic structure within analysis. I dedicated the first volume of my book to my parents and the second volume to my wife and three children. Cambridge University Press has reissued both volumes in paperback editions.